(Bloomberg) -- Traders are being tempted back to Italy’s $2.4 trillion sovereign-bond market, but this time they are buying more protection. Options on two-year German debt futures this week flashed one of their most bullish signs in more than a year. The derivatives are a principal hedge against a sell-off in Italian securities. The need for shelter was highlighted on Wednesday after one of Italy’s two deputy prime ministers said abandoning a key election pledge on spending would threaten the government. Traders are accumulating contracts that pay out when the two-year “Schatz” futures rally. Open interest in calls is growing faster than for put options. 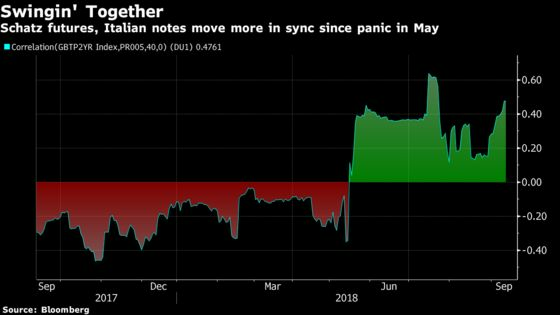 While the futures are a haven from many varieties of market turbulence, they’ve been gaining this year on concern the Italian government’s spending plans could clash with European Union rules. 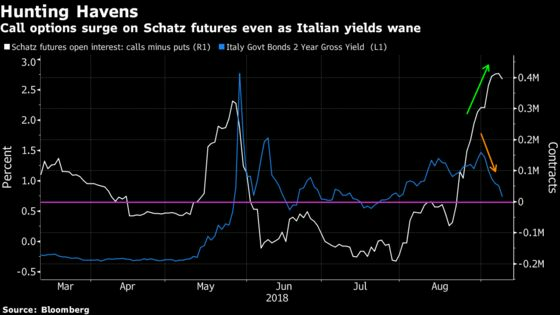 The bullish change in open interest for Schatz may indicate traders remain wary of reassurances by Italy’s populist government leaders that they will obey EU budget discipline. Their soothing comments in recent days have triggered a rally in the debt securities of Italy, the world’s third-most indebted nation compared with economic output. Many investors are keeping their hedges or adding to them on concern that budget-related risks could linger in the coming months, according to two rates traders familiar with the transactions, who asked not to be identified because the people are not authorized to speak publicly. The accumulation began in August. That was logical, as the yield on Italian two-year bonds surged. Yet they’ve still added to the hedge even after the yield dove almost 70 basis points in September, and as the implied volatility on the call options has eased. Volatility gives an indication of market expectations for future price movements. The two most popular strike prices are at 112.10 and 112.30, which equate to Germany two-yields between -0.66 and -0.74 percent. That compares with a -0.56 percent yield at the close on Tuesday.